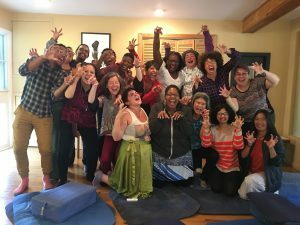 To address a critical mass in questions arising at centers about how to be socially engaged as Shambhala warriors, a group of activists recently conducted the first Shambhala Social Engagement Think Tank. The project consisted of collecting questions that have been arising within this community to explore conversations that will be necessary to engage, both outwardly and inwardly, in these dark times. We combined Shambhala practices and forms with the practices of contemporary activist communities such as caucusing, InterPlay, and Open Space Technology. The fact that only half of the group was white allowed for a unique environment, one that may not have existed in Shambhala prior to the Think Tank. Race was the undeniable focal point in what would become a challenging but crucial discussion. There was a bit of unease and a lot of excitement. We opened with a lhasang in both English and Spanish, along with a land acknowledgement from Valentino Romero and Sky Lake Director Jen Woodin. As we began to welcome the land, lineage, and one another, people began to open up and we created shared agreements for our time together. Agreements like this are common in activist spaces. They point toward acknowledging right speech and clarifying the group’s intentions. We had a session of mindful embodied practice called “Social Presencing Theatre” with Acharya Arawana Hayashi. At this point it felt clear that people had different needs for the space, and we made agreements to honor all of those needs. We did the best we could to hold those agreements through our Open Space Technology (OST) session and into the evening, but there was massive tension building in the group. In the small OST groups, the discussions became very theoretical. I experienced growing pressure and density in the environment since our conversations were so action oriented. We hadn’t prepared the ground enough to begin talking about the path or fruition of our visions. During that evening, something moved in me, and I recognized the ways I want to engage more deeply as a warrior. How could I personally navigate these spaces where rich, well-facilitated conversations can move from body to head in the flip of a switch? How can that contribute to the engaged work I am already doing? I wasn’t alone in experiencing these feelings. The next morning, after sitting practice and before the first discussion began, Aarti Tejuja, Director of the Office of Social Engagement, stood up and announced, “There’s been a change!” She walked over to the wall and ripped down a large schedule for the weekend that had been hanging up. “Not everyone’s needs are being met by this schedule,” she said. People had personally approached her the night before saying they were feeling alienated by the theoretical tone of the discussions and that they needed a more embodied approach to connect with the group. The eventual consensus from the planning team was to bring in InterPlay, led by Kelsey Blackwell. A few participants resisted the change, and asked that the schedule stay the same. Comments were made that people have their own embodiment practices. The change wasn’t up for debate, and we soon found ourselves spread throughout the shrine room preparing for InterPlay with Kelsey, who suggested we squish up our faces, roll out our joints, and make any shape our bodies wanted. I could sense my body feeling more in the room, and more present to the people around me from just a few simple movements. I was quickly challenged to let my guard down when I was partnered up with another participant and asked to tell a story in a made-up language. I was surprised at the hand gestures, noises, and body shapes I came up with, and was curious about the overall experience.The biggest challenge came when Kelsey announced we’d be moving from pairs into a societal practice of InterPlay with all thirty-two participants. This societal InterPlay granted Kelsey the power to create six groups, each with different roles. One group was to lie on the floor, another had to hold chairs and move around the room. My group was to stand and watch what was occurring, another group was empowered to do whatever they wanted, floating through the room at their leisure. With the exception of one participant, everybody stayed in their particular roles and didn’t challenge the game. Most everyone accepted their role and in the share-out expressed feelings of isolation, fear for their own safety or the safety of others; some expressed boredom. Why didn’t we leave the role given to us when we experienced fear or isolation? Why didn’t more of us take care of others when we saw them in discomfort? It was just a game, right? I’ve been reflecting on this experience, and considering the role of the body in our understanding of social engagement in Shambhala. The body holds our wisdom and our trauma. It is worth acknowledging our differences and the structures in power that seek to keep certain bodies in certain places. 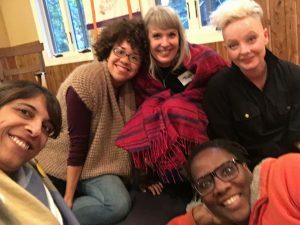 The session of InterPlay allowed us to connect to the body, and to prepare for deeper conversations relating to race later that day. We began caucusing after lunch, and I sat down with the seventeen other white participants at the Think Tank, separate from the people of color group. The feeling of the white group was uncomfortable, impermeable, and guarded. I couldn’t help but feel that this was deeply important work we were embarking on, and that this type of caucusing was another rare experience in Shambhala. The need for caucusing was clear in an ask from many people of color that weekend, and that need was centered by the planning team. I could feel the resistance from many white participants to caucusing, and could sense many were wondering why we all couldn’t just be together. I had friends and freshly budding relationships in the PoC group, and of course I was curious about what was happening. I could hear laughter and joy and bouts of silence from the room, and could sense there was amazing connection happening. I could also feel our group was left out of it. It is not a common experience for white folks to be left out of a practice space or experience, but that was a big take-away from the weekend. How did it feel as white practitioners, who dominate the leadership and participation space, to be told that things were going to change? That things needed to change, and that we had to sit with the discomfort and confusion? Each of us in the white group began to share what brought us to the Think Tank, and what was coming up surrounding race. For some in the group, this was the first time race had ever been discussed in such a manner. Expressions of trepidation, guilt, and shame came through, meriting critical discussions of their own. For others, their work was to point out that this group expressed many qualities of whiteness that warranted time and work to better understand. Recurrent themes of the exercises included white people feeling “left out,” but there was simultaneous, widespread acknowledgement of the need to do our own work–to understand where white folks seek to maintain white supremacist power. Especially before diving into race discussions with PoC. I’m carrying many questions with me from that weekend. Questions such as: How can the feeling of being left out act as a teaching when considering the role of whiteness in our sangha? Why do many white practitioners shy away from conversations centering on race in white-only spaces, yet want to be inclusive and diverse? How can a game like InterPlay show us where we’re blindly (or not) keeping certain groups of people down while maintaining other groups of people in power? Thank you for sharing. Helpful to learn and feel . Thank you for your comment Timaree! I am thankful & challenged that the two continue to go hand in hand.